Affleck's 'Live By Night': An Ambitious, Frenetic But Overstuffed Gangster Film Ben Affleck wrote the screenplay, directed and stars in this bloated genre exercise, which never slows down enough to pack any real emotional impact. Ben Affleck and Sienna Miller in Live by Night. Ben Affleck made his debut as a director with 2007's Gone Baby Gone, a much-admired adaptation of a Dennis Lehane crime novel. After the success of 2012's Argo — which won the Academy Award for best picture without so much as a nomination for Affleck, its director and co-star — he was in a position to choose his projects, but he stuck with the one he'd been eyeing even before Argo was released: Live By Night, another Lehane book, this one about a Central Florida bootlegger's struggles with rival gangsters and the Ku Klux Klan during the late 1920s and early 1930s. 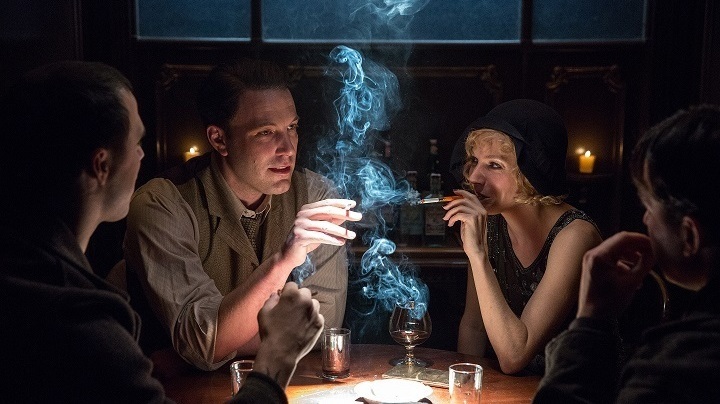 But a funny thing happened on the way to the speakeasy: Affleck became a movie star again. He played a murder suspect in Gone Girl, a critical and commercial hit, and signed a multi-picture deal as the latest Batman. Live by Night was repeatedly back-burnered. Part of the problem is Affleck's screenplay, which tries to preserve more of Lehane's 400-page book (itself the middle installment in a trilogy) than the film's 128-minute run time can handle. The first act, which establishes Affleck's Joe Coughlin as World War I vet-turned-hoodlum in Prohibition-era Boston, is particularly bloated. Coughlin is in love with a mobster's mistress (Sienna Miller), and after a botched heist and a betrayal by his moll, he finds himself beaten and about to be murdered. His police-captain father (Brendan Gleeson, a pleasure to watch no matter how small the role) saves his life, and even blackmails a District Attorney to secure leniency for his son's many crimes. Coughlin serves three years in prison, then finds himself drafted into the service of Italian mob capo (Remo Girone), who sends him to Tampa to clean up his operation illegally importing Cuban rum. Want to know more about how the son of a high-ranking cop became a crook? Me, too. Guess I'll have to read Lehane's book. Anyway, the movie should've eighty-sixed all that preamble and just opened with Coughlin getting off the train in Ybor City, where it finally manages a foothold on some less-trod narrative turf. Affleck has some nice chemistry with Chris Messina, who plays his lieutenant and guide to the shadowy parts of the Sunshine State, and his relationship with Chris Cooper — as Irving Figgis, a pragmatic lawman who's willing to turn a blind eye to crimes of vice if the crooks keep violence to a minimum — is the picture's most intriguing. Figgis has a teenage daughter, Loretta (Elle Fanning), who's off to be a star in Hollywood. Of all the story's shaggy turns, that Chief Figgis has given his blessing to this plan is the hardest to swallow. Coughlin is a Irish Catholic working for Italians, romantically involved with a Cuban woman (Zoe Saldana), and running speakeasies that cater to black people. Any one of those would be reason enough to rile the KKK. Stopping a local Klansman from bombing and shooting up his clubs means blackmailing Chief Figgis with dirty pictures of his strung-out little girl. Once she gets clean, she becomes a church leader who campaigns against the casino Coughlin is building on the expectation that after prohibition ends, gambling, like hooch, will eventually be legalized. Like Cooper, Fanning makes a strong impression in just a handful of scenes, which just underscores how sterile the movie is when she (and he) is not in it. Again, it's a miniseries worth of story packed too tightly to resonate on an emotional level. The overcaffeinated pace also prevents the film from breathing photographically, even though Affleck hired the great cinematographer Robert Richardson, who has shot multiple features for Martin Scorcese, Oliver Stone, and Quentin Tarantino, including last Christmas's Ultra Panavision 70 Western The Hateful Eight. That fact, even more than Affleck's haphazard and intrusive voice-over narration, betrays the yawning gulf between what Live By Night aims for and what it delivers.